The cold weather has taken its toll on my hands, I'm experiencing visible dryness, cracking and mild eczema patches. I'm applying hand creams like they are going out of fashion. I have some firm favourites I rely on but have also been testing out others which are new to me. Here's my thoughts on the hand creams pictured above. Pai Fragonia & Sea Buckthorn Hand Cream - I first reviewed in 2013 and it's my most repurchased hand cream. I find the formulation a happy medium between being light and non greasy but hydrating on my dry skin. It contains wonderful ingredients such as seabuckthorn, rosehip, macadamia, avocado and shea butter. I often have this on my desk at work because I works quickly and doesn't leave a greasy residue. Madara Protecting Hand Cream - in comparison to Pai this is a heavier cream but still absorbs beautifully so I'm not left with a greasy residue. When I wash my hands I still feel protected and don't always need to re-apply immediately. The formulation is cocoa butter based with sunflower seed oil, cranberry, plum seed oil, chamomile and calendula. I generally keep this one on my bedside table as it's a good one to use through out the day but especially at night. Pure Potions Skin Salvation Intensive Hand Cream - this is my new favourite, Pure Potions is a brand formulating products for those prone to eczema, psoriasis, dermatitis and dry skin. The formulation contains shea butter, seabuckthorn, hemp, calendula, chamomile and chickweed so it has soothing and hydrating properties. A little goes a long way. My hands have been like sandpaper so this cream disappears quickly into my skin but doesn't leave a greasy residue. I'd suggest Pure Potions is similar to Madara in that I feel protected when washing hands and re-application isn't immediately needed. Organii Gentle Care Hand Cream for Sensitive Skin - this is the most affordable hand cream in my collection. It's a nice cream but doesn't contain shea or cocoa butters to give it a heavy hydrating texture. I'd describe this as a lotion which may work better for me during the summer months. It will hydrate to an extent but that sensation doesn't last once I wash my hands or go outside into the cold. A good one to use as a light top up but expect to apply often if your skin is very dry. Bentley Organic Rose Geranium Hand Cream - this has a pleasant consistency, a happy medium between the lightness of Organii but not super rich like Pure Potions. It does contain hydrating ingredients like cocoa butter, shea butter, almond oil and avocado oil. It sinks into my dry skin quickly without greasiness, Unfortunately when my hands are at their driest it can sting on application and that possibly has something to do with my sensitivity to linalool. Despite my issues I think it’s an affordable choice and worth consideration. 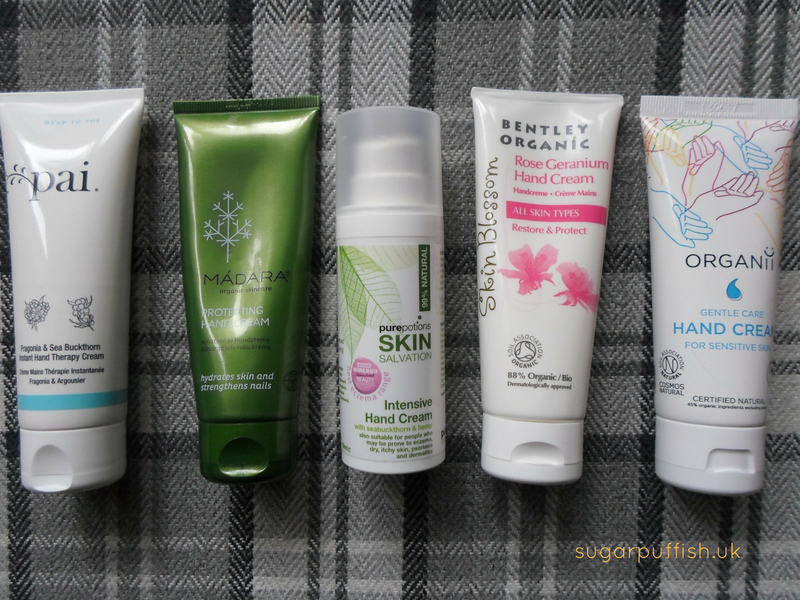 Have you used any of these hand creams or do you have a favourite alternative?